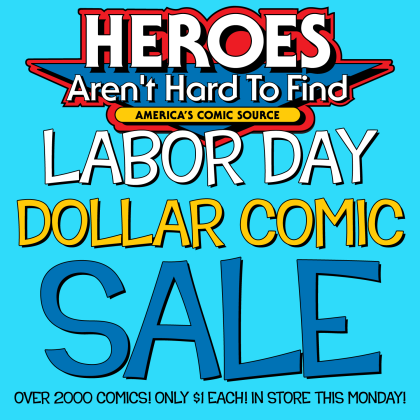 THE HEROESONLINE BLOG | Sale! 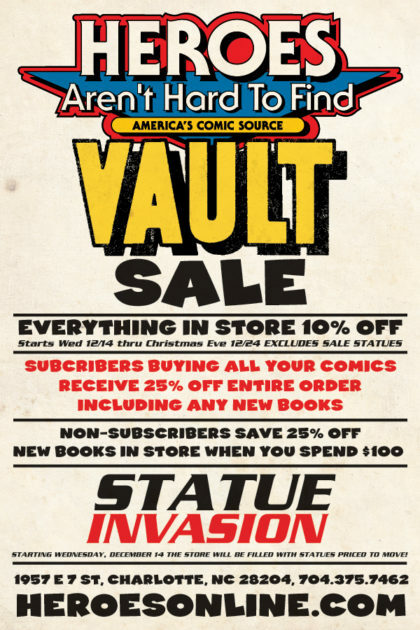 END OF YEAR AMNESTY SALE!! NOW UNTIL JANUARY 8TH!! But do you know which “King” was born 7 days after New Year’s in 1935?? ELVIS, the KING of Rock ‘n’ Roll…That’s WHO!! 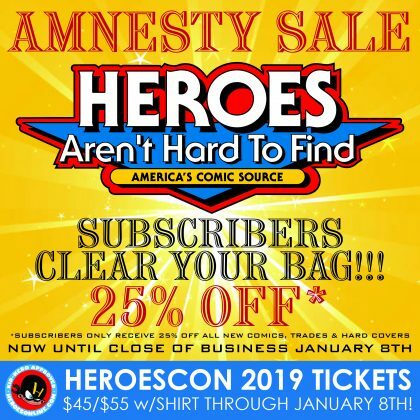 SO…in honor of three of the BEST Holiday’s on the Calendar…HEROES is celebrating until Elvis leaves the building on Tuesday, January 8th, by offering our RESERVE CUSTOMERS 25% OFF on all NEW merchandise when you clear out your reserve bag!! 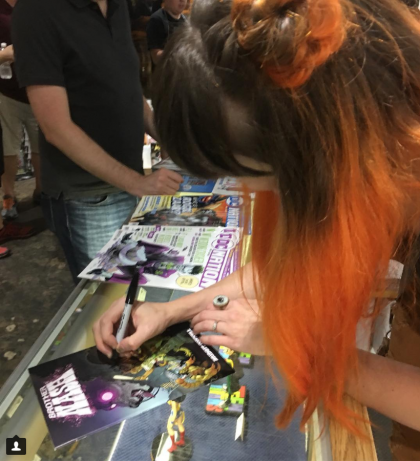 We have also extended our HEROESCON 2019 TICKET SALE until Elvis blows out the candles on his birthday cake…so be sure to get your ticket before prices go up on January 9th!! 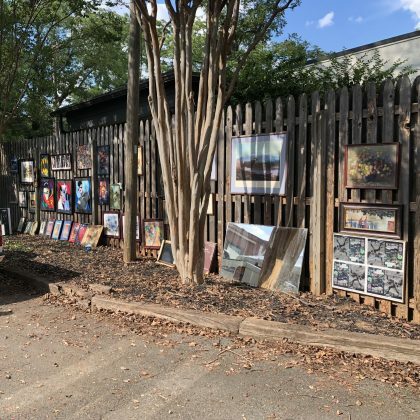 November 09, 2017 By: Rico Renzi Category: EVENTS, Sale! 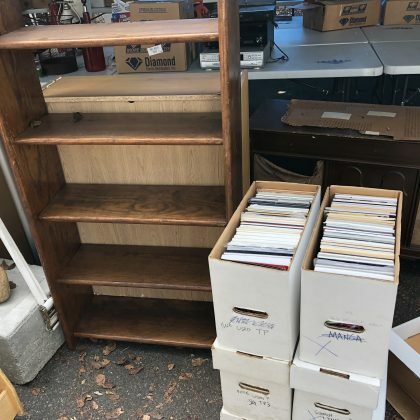 We just got in a great new collection of over 10,000 comics but we just don’t have room to store them! These books date from the early 80’s to about 2015. 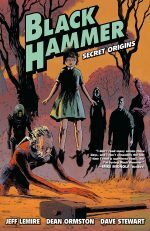 They include Marvel, DC, Image and a few indies. No duplication. Friday 11/10 at 10 am those fresh collector’s items will be in the store for $2 each with discounts for quantity purchases. Saturday 11/11, this bargain stock will be $1 each, again with discounts for quantity. Sunday 11/12 the remaining stock goes to 50 cents apiece, with quantity discounts still available! Whatever is left on Monday 11/13 will be 25 cents each and a reasonable offer will take them all. So 4 days only! Get in here and fill those want lists! 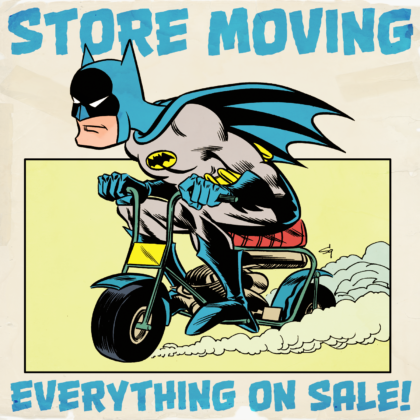 STORE MOVING :: EVERYTHING ON SALE! August 25, 2017 By: Rico Renzi Category: EVENTS, Sale! 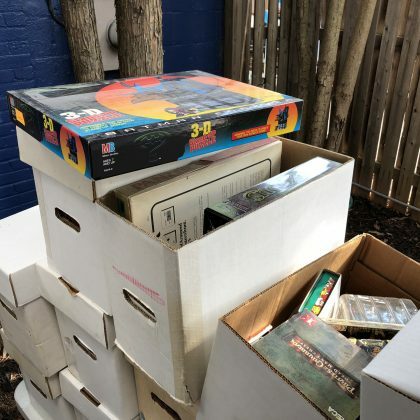 We don’t want to carry all these comics across the parking lot if we don’t have to! Help us out by taking some merchandise off our hands at DEEP DISCOUNTS STARTING NOW! All these discounts are available on items currently in the store, we do not currently have access to all of our stock due to the move. Again, this sale is on already in-store items only. We have to be completely out of our current store by Thursday the 31st so come in now for the best selection. 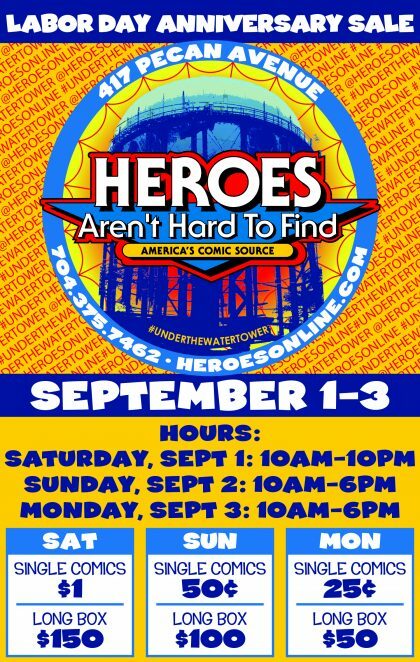 We’re getting the new location ready as quickly as we can and plan to open for our first New Comic Book Day on September 6th. 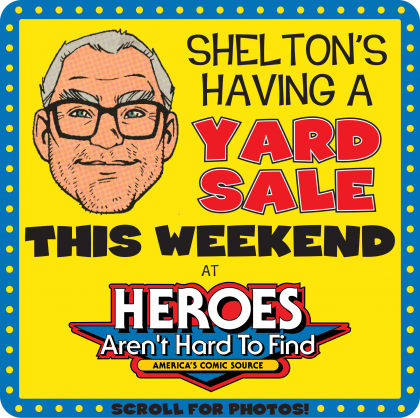 In the meantime, please check our social media (here, Facebook, Twitter, Instagram) for info on yard sale, grand opening celebrations and other fun things we’re cooking up while we get our new building ready for you! We appreciate your patience as we’re figuring everything out to make our new location the best it can be. Thank you! 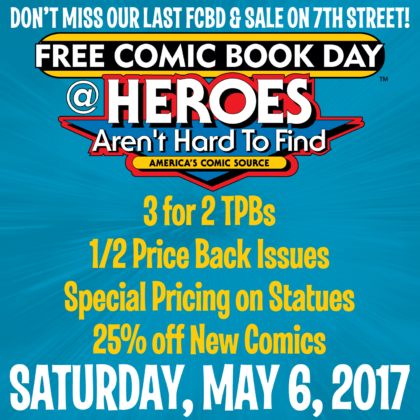 April 14, 2017 By: Rico Renzi Category: EVENTS, Free Comic Book Day, Sale! 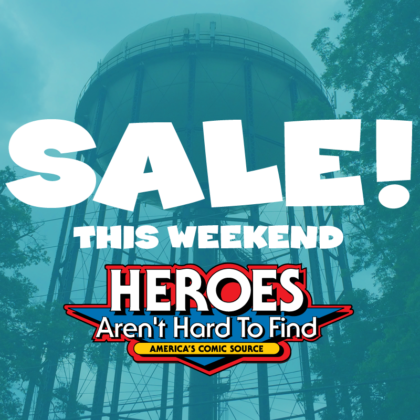 FIRST EVER HEROES VAULT SALE! STARTS WEDNESDAY! December 09, 2016 By: Rico Renzi Category: EVENTS, Sale! October 21, 2016 By: Rico Renzi Category: Sale! 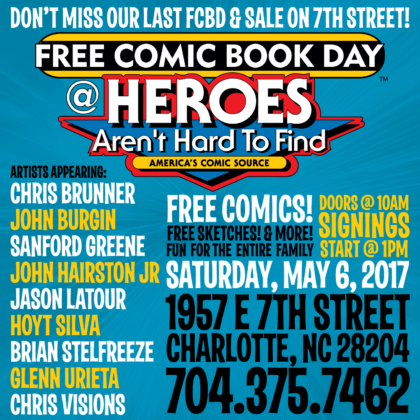 Here’s your first look at the Heroes Aren’t Hard To Find variant cover of the latest iteration of Los Bros’ Love & Rockets! 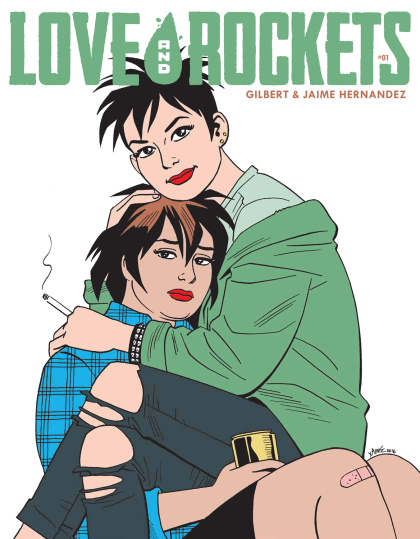 We only do store variants when we really believe in a book and Love & Rockets has stood the test of time. 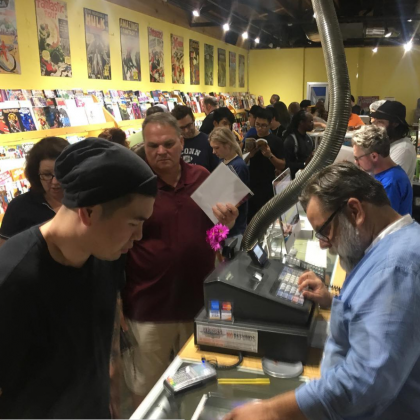 Los Bros have blazed a path that many independent creators have followed and we are honored to have their first and only store variant cover for the relaunch of their series’ return to magazine format! These are only $4.99 each +s&h and going quickly! September 02, 2016 By: Rico Renzi Category: Sale!